I am here in a spirit of gratitude and humility for the trust you have placed in me to serve the world’s peoples. “We the peoples”, and the United Nations, face grave challenges. Our world is in trouble. People are hurting and angry. They see insecurity rising, inequality growing, conflict spreading and climate changing. The global economy is increasingly integrated, but our sense of global community may be disintegrating. Societies are fragmented. Political discourse is polarized. Trust within and among countries is being driven down by those who demonize and divide. We are a world in pieces. We need to be a world at peace. And I strongly believe that, together, we can build peace. We can restore trust and create a better world for all. I will focus today on seven threats and tests that stand in our way. For each, the dangers are all too clear. Yet for each, if we act as truly united nations, we can find answers. The use of nuclear weapons should be unthinkable. Even the threat of their use can never be condoned. But today global anxieties about nuclear weapons are at the highest level since the end of the Cold War. The fear is not abstract. Millions of people live under a shadow of dread cast by the provocative nuclear and missile tests of the Democratic People’s Republic of Korea. Within the DPRK itself, such tests do nothing to ease the plight of those who are suffering hunger and severe violations of their human rights. I condemn those tests unequivocally. I call on the DPRK and all Member States to comply fully with Security Council resolutions. Last week’s unanimous adoption of resolution 2375 tightens sanctions and sends a clear message regarding the country’s international obligations. I appeal to the Council to maintain its unity. Only that unity can lead to the denuclearization of the Korean Peninsula and — as the resolution recognizes — create an opportunity for diplomatic engagement to resolve the crisis. When tensions rise, so does the chance of miscalculation. Fiery talk can lead to fatal misunderstandings. The solution must be political. This is a time for statesmanship. We must not sleepwalk our way into war. More broadly, all countries must show greater commitment to the universal goal of a world without nuclear weapons. The nuclear-weapon states have a special responsibility to lead. Today, proliferation is creating unimaginable danger, and disarmament is paralyzed. There is an urgent need to prevent proliferation, to promote disarmament and to preserve gains made in these directions. These goals are linked. Progress on one will generate progress on the other. Let me turn to the global threat of terrorism. Nothing justifies terrorism — no cause, no grievance. Terrorism continues to take a rising toll of death and devastation. It is destroying societies, destabilizing regions and diverting energy from more productive pursuits. National and multilateral counter-terrorism efforts have indeed disrupted networks, reclaimed territory, prevented attacks and saved lives. But we need to intensify this work. Stronger international cooperation remains crucial against terrorism. I am grateful to the General Assembly for approving one of my first reform initiatives: the establishment of the UN Office on Counter-Terrorism. Next year, I intend to convene the first-ever gathering of heads of counter-terrorism agencies of Member States to forge a new International Counter-Terrorism Partnership. But it is not enough to fight terrorists on the battlefield or to deny them funds. We must do more to address the roots of radicalization, including real and perceived injustices and high levels of unemployment and grievance among young people. Political, religious and community leaders have a duty to stand up against hatred and serve as models of tolerance and moderation. Together, we need to make full use of UN instruments, and expand our efforts to support survivors. Experience has also shown that harsh crackdowns and heavy-handed approaches are counterproductive. As soon as we believe that violations of human rights and democratic freedoms are necessary to win the fight, we might have lost the war. Third, unresolved conflicts and systematic violations of international humanitarian law. We are all shocked by the dramatic escalation of sectarian tensions in Myanmar’s Rakhine State. A vicious cycle of persecution, discrimination, radicalization and violent repression has led more than 400,000 desperate people to flee, putting regional stability at risk. I take note of State Counsellor Aung San Suu Kyi’s address today – and her intention to implement the recommendations of the Advisory Commission on Rakhine State that was chaired by Kofi Annan within the shortest time possible. Let me emphasize again: The authorities in Myanmar must end the military operations, allow unhindered humanitarian access and recognize the right of refugees to return in safety and dignity. They must also address the grievances of the Rohingya, whose status has been left unresolved for far too long. No one is winning today’s wars. From Syria to Yemen, from South Sudan to the Sahel, Afghanistan and elsewhere, only political solutions can bring peace. We should have no illusions. We will not be able to eradicate terrorism if we do not resolve the conflicts that are creating the disorder within which violent extremists flourish. Last week I announced the creation of a High-Level Advisory Board on Mediation. Those eminent individuals will allow us to be more effective in brokering peace around the world. The United Nations is forging closer partnerships with key regional organizations such as the African Union, the European Union, the League of Arab States and the Organization of Islamic Cooperation. We continue to strengthen and modernize peacekeeping – protecting civilians and saving lives around the world. And since taking office, I have sought to bring together the parties to conflict, as well as those that have influence on them. As a meaningful example, I am particularly hopeful about tomorrow’s meeting on Libya. Last month, I visited Israel and Palestine. We must not let today’s stagnation in the peace process lead to tomorrow’s escalation. We must restore the hopes of the people. The two-state solution remains the only way forward. It must be pursued urgently. But I must be frank: in too many cases, the warring parties believe war is the answer. They may speak of a willingness to compromise. But their actions too often betray a thirst for outright military victory, at any cost. Violations of international humanitarian law are rampant, and impunity prevails. Civilians are paying the highest price, with women and girls facing systematic violence and oppression. I have seen in my country, and in my years at the United Nations, that it is possible to move from war to peace, and from dictatorship to democracy. Let us push ahead with a surge in diplomacy today and a leap in conflict prevention for tomorrow. Fourth, climate change puts our hopes in jeopardy. Last year was the hottest ever. The past decade has been the hottest on record. Average global temperature keeps climbing, glaciers are receding and permafrost is declining. Millions of people and trillions of assets are at risk from rising seas and other climate disruptions. The number of natural disasters has quadrupled since 1970. The United States, followed by China, India, the Philippines and Indonesia, have experienced the most disasters since 1995 – more than 1,600, or once every five days. I stand in solidarity with the people of the Caribbean and the United States who have just suffered through Hurricane Irma, the longest-lasting Category 5 storm ever recorded. And Maria is already on its way. We should not link any single weather event with climate change. But scientists are clear that such extreme weather is precisely what their models predict will be the new normal of a warming world. We have had to update our language to describe what is happening: we now talk of mega-hurricanes, superstorms and rain bombs. It is time to get off the path of suicidal emissions. We know enough today to act. The science is unassailable. I urge Governments to implement the historic Paris Agreement with ever greater ambition. I commend those cities that are setting bold targets. I welcome the initiatives of the thousands of private enterprises – including major oil and gas companies – that are betting on a clean, green future. Energy markets tell us that green business is good business. So is the growing evidence that economies can grow as emissions go down. New markets, more jobs, opportunities to generate trillions in economic output. The facts are clear. Solutions are staring us in the face. Leadership needs to catch up. Cinquièmement, les inégalités croissantes minent les fondements de la société et le contrat social. L’intégration des économies mondiales, l’expansion du commerce et les avancées technologiques spectaculaires ont apporté des bienfaits remarquables. Plus de personnes se sont extirpées de la pauvreté extrême que jamais auparavant. La classe moyenne mondiale est aussi plus importante que jamais. Davantage de personnes vivent plus longtemps et en meilleure santé. Mais les progrès ne sont pas équitables. Nous voyons des disparités criantes dans les revenus, l’égalité des chances et l’accès aux résultats de la recherche et de l’innovation. Huit hommes représentent autant de richesse mondiale que la moitié de l’ensemble de l’humanité. Des régions, des pays et des communautés entiers restent loin des vagues de progrès et de croissance, livrés à eux-mêmes dans les « Rust Belts » de notre monde. Cette exclusion a un prix : frustration, aliénation, instabilité. Mais nous avons un plan visant à changer de cap – pour parvenir à une mondialisation équitable. Ce plan est le Programme 2030. La moitié de notre monde est de sexe féminin. La moitié de notre monde a moins de 25 ans. Nous ne pouvons pas atteindre les objectifs de développement durable sans tirer parti du pouvoir des femmes et nous appuyer sur l’énorme énergie des jeunes. Nous savons à quelle vitesse peut s’opérer la transformation de nos jours. Nous savons qu’avec une richesse et des actifs mondiaux équivalent à des milliards, nous ne sommes pas en manque de financements. Trouvons la sagesse d’utiliser les outils, les plans et les ressources déjà entre nos mains pour parvenir à un développement durable et bénéfique à tous – un objectif en soi mais aussi notre meilleur instrument de prévention des conflits. Le côté obscur de l’innovation est la sixième menace que nous devons affronter et il est passé de la frontière à la porte d’entrée. La technologie continuera d’être au cœur des progrès partagés. Mais l’innovation, aussi essentielle soit-elle pour l’humanité, peut avoir des conséquences imprévues. Les menaces liées à la cybersécurité s’accentuent. La guerre cybernétique devient de moins en moins une réalité cachée. Elle est de plus en plus capable de perturber les relations entre États et de détruire certaines des structures et des systèmes de la vie moderne. Les progrès dans le cyberespace peuvent certes autonomiser les personnes, mais ce qu’on appelle le « Dark Web » montre que certains utilisent ce potentiel pour nuire et asservir. L’intelligence artificielle est une nouvelle donnée qui peut stimuler le développement et améliorer les conditions de vie de façon spectaculaire. Mais elle peut aussi avoir un effet dramatique sur les marchés du travail et, en fait, sur la société mondiale et sur le tissu social même. Le génie génétique est passé des pages de la science-fiction au marché – mais il a engendré de nouveaux dilemmes éthiques non résolus. À moins qu’elles ne soient traitées de manière responsable, ces avancées pourraient causer des dommages incalculables. Los Gobiernos y las organizaciones internacionales sencillamente no están preparados para esta nueva situación. Las formas tradicionales de regulación simplemente ya no son válidas. Está claro que este tipo de tendencias y capacidades exige una nueva generación de pensamiento estratégico, de reflexión ética y de regulación. Las Naciones Unidas están dispuestas a ser un foro en el que los Estados Miembros, la sociedad civil, las empresas y el mundo académico puedan reunirse y hablar sobre el camino a seguir, en beneficio de todos. Finally, I want to talk about human mobility, which I do not perceive as a threat even if some do. I see it as a challenge that, if properly managed, can help bring the world together. Let us be clear: we do not only face a refugee crisis; we also face a crisis of solidarity. Every country has the right to control its own borders. But that must be done in a way that protects the rights of people on the move. Instead of closed doors and open hostility, we need to re-establish the integrity of the refugee protection regime and the simple decency of human compassion. With a truly global sharing of responsibility, the number of refugees we face can be managed. But too many states have not risen to the moment. I commend those countries that have shown admirable hospitality to millions of forcibly displaced people. We need to do more to support them. We also need to do more to face the challenges of migration. The truth is that the majority of migrants move in a well-ordered fashion, making positive contributions to their host countries and homelands. It is when migrants move in unregulated ways that the risks become clear – risks for states but most especially risks for migrants themselves exposed to perilous journeys. Migration has always been with us. Climate change, demographics, instability, growing inequalities, and aspirations for a better life, as well as unmet needs in labour markets, mean it is here to stay. The answer is effective international cooperation in managing migration to ensure that its benefits are most widely distributed, and that the human rights of all concerned are properly protected. From my experience, I can assure you that most people prefer to realize their aspirations at home. We must work together; development cooperation must be oriented in such a way to make sure that they can do so. Migration should be an option, not a necessity. We also need a much stronger commitment of the international community to crack down on human traffickers, and to protect their victims. But let us be clear, we will not end the tragedies on the Mediterranean, the Andaman Sea and elsewhere without creating more opportunities for regular migration. This will benefit migrants and countries alike. Refugees, internally displaced persons and migrants are not the problem; the problem lies in conflict, persecution and hopeless poverty. I have been pained to see the way refugees and migrants have been stereotyped and scapegoated – and to see political figures stoke resentment in search of electoral gain. In today’s world, all societies are becoming multicultural, multiethnic and multi-religious. This diversity must be seen as a richness, not as a threat. But to make diversity a success, we need to invest in social cohesion, so that all people feel that their identities are respected and that they have a stake in the community as a whole. 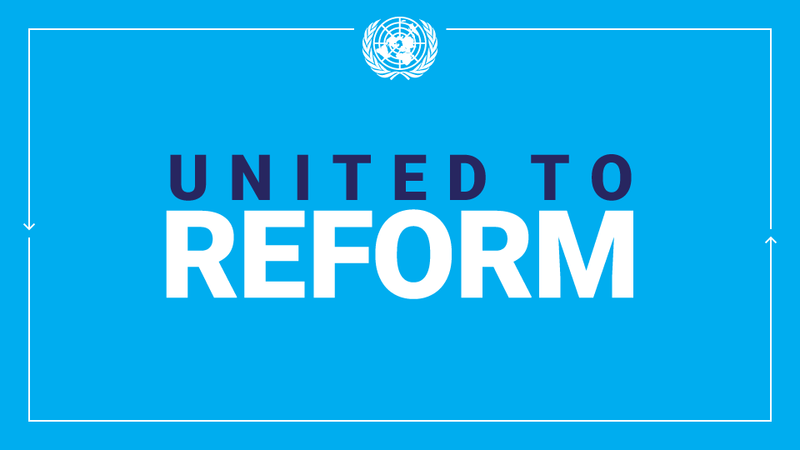 We need to reform our world, and I am committed to reforming the United Nations. — and to embrace management practices that advance those goals instead of hindering them. We have launched a new victims-centered approach to preventing sexual exploitation and abuse. We have a roadmap to achieve gender parity at the United Nations – and we are already on our way. We are here to serve: to relieve the suffering of “we the peoples”; and to help fulfill their dreams. We come from different corners of the world. Our cultures, religions and traditions vary widely – and, I would say, wonderfully. At times, there are competing interests among us. At others, there is even open conflict. That is exactly why we need the United Nations. That is exactly why multilateralism is more important than ever. We call ourselves the international community. We must act as one, because only together, as united nations, can we fulfil the promise of the Charter and advance human dignity for all. Thank you. Shokran. Xie Xie. Merci. Spasibo. Gracias. Obrigado. This entry was posted in UN SECRETARY GENERAL MESSAGES on September 27, 2017 by STELLA VUZO.